Julia Olaya Valencia, 64, and her husband Merced Lequernaqué León, 93, live in Vichayal, a small town in Paita Province, located in the Piura Region of Peru. Merced has trouble walking, so Julia spends much of her time taking care of him and tending to household chores. A midwife for 19 years, Julia is the family’s sole income earner. In addition to a few animals, the couple has a garden that features banana and lime trees, which Julia takes care of. “I feed my animals; I water the plants; I work, and I cook,” Julia said. 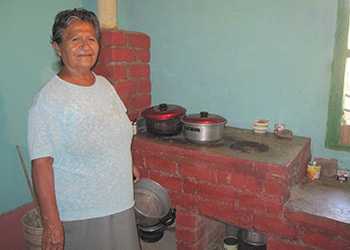 One day, as she was going to buy kerosene for starting the stove, Julia’s niece told her about a Heifer Peru project, Sustainable Livelihoods in the Rural Community of San Lucas de Colan, that was helping families in the area build improved kitchens. Julia learned that the new kitchens featured stoves with chimneys that would shuttle smoke outdoors, rather than pollute the whole house. Since joining the project, Julia’s life has improved in countless ways. “I used to spend between 30-35 Peruvian Nuevos Soles (about $10-12) buying wood or gas,” she said. “If I used gas, I had to buy a ball of gas that costs 35 Nuevo Soles (about $12), and if I used the wood stove, I had to buy firewood bundles. Monthly, I would spend 30 Nuevos Soles (about $10) on bundles.” Now Julia spends 10 Nuevos Soles, or about $3, on wood. In addition, since her improved kitchen uses small sticks, the wood is easier to get. Thanks to the improved kitchen, Julia’s expenses have dropped by 66 percent and her house is no longer filled with smoke. “I never imagined I would have an improved kitchen,” she said, I did not even know it existed. Now that I have one and I see the benefits, I tell my neighbors and encourage them to get one.” Julia is grateful to Heifer International for giving her the opportunity to improve her family’s quality of life. You can improve lives in Peru.